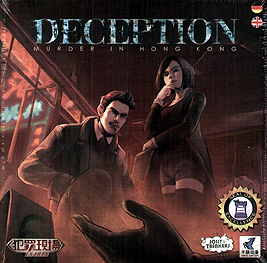 In Deception: Murder in Hong Kong, players find themselves in a scenario of intrigue and murder deduction and deception. One player is the Murderer, secretly choosing their weapon and the evidence they leave behind. Another is the Forensic Scientist who holds the key to convicting the criminal but is only able to express their knowledge through analysis of the scene. The rest are investigators, interpreting the clues to solve the crime - and the killer is among them. Investigators must collaborate and use their wits, their hunches, and their keen deductive insight to correctly identify the means of murder and the key evidence to convict the killer. The murderer must mislead and confuse the investigators to save themselves. Do you have what it takes to see through the lies and catch the criminal in your ranks or will they muddy the waters long enough to get away with murder?